OTTAWA - Thousands of people marched through the streets of Ottawa on Thursday in an annual protest to end legalized abortions. Throngs of teenagers, given the day off by their Roman Catholic schools to attend the event, sang "Life is Life, Na Na Na Na Na," as they drifted slowly away from Parliament Hill into the streets. They were joined by religious leaders and people of all ages, including families with small children, in a march that lasted nearly two hours. The protest came just two weeks after a Conservative MP tried to reopen the national abortion debate. Prime Minister Stephen Harper rejected Stephen Woodworth's private member's motion in late April, but that didn't stop critics from accusing the Tories of using the proposal as a back-door way to rekindle debate over the sensitive topic. While it was difficult to measure the size of the crowd on the Hill, police estimated that there were fewer people than the 15,000 that the Campaign Life Coalition claimed attended last year's event. The protesters called on the government to legislate protection for all human beings from the time of conception to the moment of natural death. 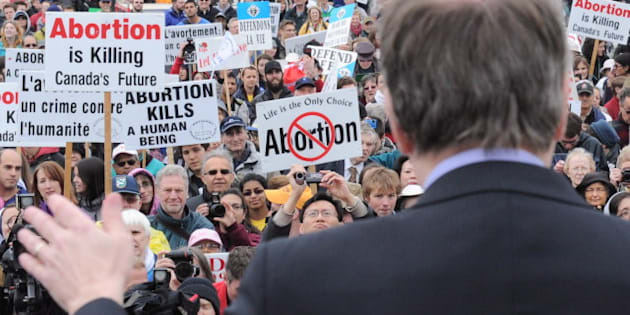 Regardless of the prime minister's insistence that his government won't reopen the abortion debate, it's already on, said Bruce Clemenger, president of the Evangelical Fellowship of Canada. "We cannot afford not to have the conversation," he told the crowd. "I say Parliament needs to catch up with what Canadians believe." A few dozen pro-choice protesters were also on hand, some standing off to the side chanting "my body, my choice." Woodworth's non-binding motion, which was debated for an hour last month, called for a special committee to study a criminal code provision that could redefine when human life begins. It's expected to return to the House of Commons either next month or in September for another hour of debate and a vote. CORRECTION: A previous version of this story indicated the march took place on Monday. It took place on Thursday.